The last few days of August always make me think of the lyrics of this song. It is a beautiful masterpiece of lyric and melody on the Eagles Long Road Out of Eden album. It is a song of longing, loneliness and loss. Perhaps it is also an indictment of the music industry and culture in general with its references to crows and sparrows, peacocks, flavor of the week, and the darling of the chic. Baby what a mess you're making. And I'm following the plow. The phases of the moon, the chambers of the heart, the egg and dart. Regardless of one's philosophical or spiritual perspective, the words found in the middle of 1 Peter 3:15 in the Bible are helpful. There we read that we are to "Always be prepared to give an answer to everyone who asks you to give the reason for the hope that you have." As a follower of Jesus this "hope" in me hinges upon Jesus and the resurrection. But, if you are not a follower of Jesus then the implied question is still a pertinent one. "What is the reason for the hope that is in you?" What makes it possible for you to keep on hoping in a better day? What motivates you to keep on working and doing the things you do in this world? Often, we go on through life without asking these questions. We seek to stay asleep to such big philosophical questions. Quite frankly, they can make our brain hurt or these questions might actually scare us. We hang onto anything that allows us to go on in life without thinking about ultimate questions. Dan Mangan, in his song "Sold," seems to allude to being sold out to whatever will work to keep him going. Do we, like Mangan, confess that all of this is not really worth it "'less you're sure to make it through." What does it even mean to "make it through?" Perhaps we would do well to meditate upon these words, "Always be prepared to give an answer to everyone who asks you to give the reason for the hope that you have." I'm asking. In the comment section below, tell me of the "hope in you." I often find it helpful to look at our world through two perspectives at the same time. Science is a valuable tool that allows us to understand many aspects of the universe. Faith takes us further and permits us to consider things that go beyond the scope of science. Poetry is a better medium for explaining some aspects of faith. The chorus of this Chris Rice song mentions the 23 degree tilt of our planet, to which I referred yesterday, and reminds us that molecules and men are infused with something more. Take a listen to the song at this link. "Truth is always true." But love has been here all along. "Final Move," words and music by Chris Rice. See the full lyrics here. Gravity is a universal force that acts upon all bodies with mass. It would not do if one day you became impervious to gravity and could not put your feet down on the floor next to your bed. Each day we get up and trust that gravity will still pull in the same direction it did yesterday. Mathematics works and can explain things around us. Today, one plus two equals three. The circumference of a circle is pi (3.14159...) times the diameter of the circle. We can count on these things being true tomorrow. God could have created a universe in which these basic principles changed every few moments of time. Without these bedrock principles of our universe, chaos would reign and we would be in constant danger. Our earth is in a place in our galaxy that makes it possible for life. At the centre of galaxies such as our own there is a black hole and a lot of deadly gamma rays and x-rays. Such rays would blast DNA to bits if we lived closer to the centre of the galaxy and this would make it impossible for life as we know it to exist. Furthermore, this planet on which we live is, on average, 150 million kilometers from the sun and so the life-giving energy of the sun takes about eight and a half minutes to get to us. If we were any closer to the sun our planet would be too hot for our kind of life. The average temperature on the planet Venus is 460 degrees C. Any further away and it would be too cold for us. The average temperature on Mars is -55 degrees C with an extreme range from -123 degrees C to 27 degrees C.
The planet earth has an orbit that is stable and is not unbalanced by other stars or planets in the vicinity. Thus, the duration of our orbit around the sun remains constant and we are not thrown about in a fashion that would make tidal forces extreme and land surfaces much more susceptible to large earthquakes. Our earth rotates at a relatively rapid rate around its polar axis and, much like a smooth running rotisserie, this rapid rotation keeps the entire earth warming quite nicely without extreme differences in temperature between night and day. Plants that rely on photosynthesis function well in this type of environment. Earth is also tilted at approximately 23 degrees relative to the polar axis (23.44 degrees presently - varying between 22.1 and 24.5 degrees). When you purchase a globe, that represents our planet, it usually comes in a stand that shows this 23 degree tilt. This is a representation of how our planet travels through space around our sun. The moon that circles around our planet helps to stabilize this 23 degrees that helps protect our planet and make life, as we know it, possible. This 23 degree tilt is the major contributor to why we experience seasons. If you are like me you may need to pull out a globe (or ball of some sort) and walk it around a light source to imagine how this works. This 23 degree tilt causes the northern hemisphere to be partly pointed away from the sun at one particular position in its orbit and, at this same place in the orbit, the southern hemisphere is pointed more directly at the sun. This particular point in our orbit would be approximately December 21 of each year when the northern hemisphere experiences winter and the southern hemisphere experiences summer. So, while some of us celebrate Christmas in a winter wonderland, our Australian cousins are shouting, "fire up the barbie!" and having beach parties for Christmas fun. This variation of how directly or indirectly the sun's rays hit the earth also results in variation in the heating and cooling of various places on the earth. With a greater tilt, larger portions of the planet would be perpetually frozen, while others would be too hot to sustain life. With no tilt there would be no seasons and no summer or winter. Temperatures would be more like a perpetual spring. Of course there could have been other ways to create a planet on which life might have been possible. Science fiction writers have often tried to imagine other worlds with dramatically different conditions. Poul Anderson in an epic short-story entitled, "Call Me Joe,"1 writes of a being named Joe who lives on Jupiter where the temperatures are cold enough, and the air is dense enough, for methane to exist as liquid. In this story Joe is able to live on the surface of this world, filling his lungs with this hyper-pressured atmosphere, survive the cold and drink methane like we drink water. Anderson imagines a world in which you and I could never survive; but one which is perfectly suited to Joe. Yet, even in this scenario the author imagines a degree of stability to this environment. Things like, the orbit of the planet, and physical principles of the universe in which Joe lives, and the temperatures at which he thrives remain relatively constant. So the point is not so much that our planet is the only planet on which life might thrive but rather that in order for life to develop and continue to exist on any given planet there must be some degree of stability and protection for that particular life to exist. We could go on much further speaking of the various ways in which God has placed us in a protected corner of the universe surrounded by a number of properties that make life as we know it possible. Thus, we can recognize the large body of data that suggests that God is already protecting and sustaining us in an abundance of ways. These various protections that make it possible to live on the planet earth are often spoken of in a different context. They are often used to describe the improbability that human-kind could ever come to be without the direct intervention and sustaining influence of a Creator. That is another important conversation. But, here, in a context in which we make the assumption that a creator God has indeed created this world in this way, we can also see these facets of the universe in which we live as examples of God's constant protection and sustaining activity. 1 Bova, Ben, ed. The Science Fiction Hall of Fame. Vol. Two A. New York: Tom Doherty Associates, LLC, 1973, p. 1-33. Lately, with two different groups of people, I have been discussing how one arrives at universal moral laws. 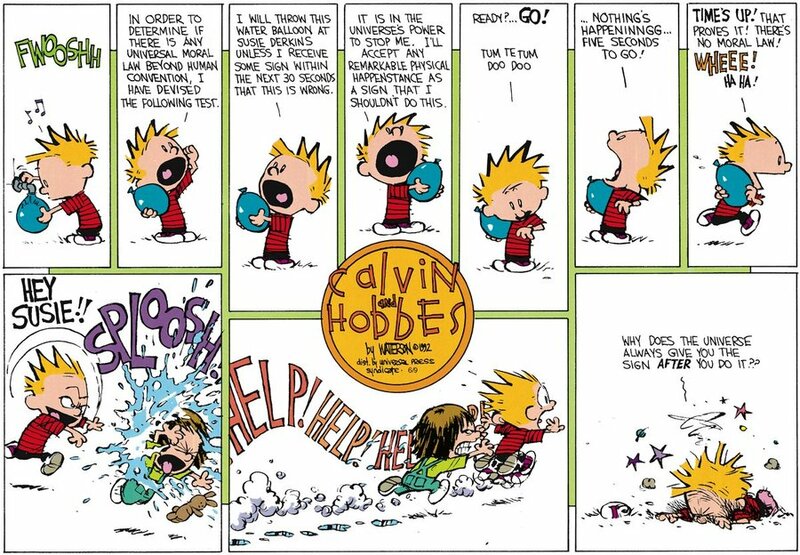 Here is Bill Watterson's light-hearted look at the question. His tongue-in-cheek analysis is certainly better than several philosophers I have read. Over the years, as I have read "Calvin and Hobbes" comics, I have often noted a philosophical and theological bent to many of the themes represented. Watterson has hinted that the names of Calvin and Hobbes were chosen as a "tip of the hat" to John Calvin and Thomas Hobbes1. Enjoy this work of art by a great professional cartoonist. 1. See Wikipedia: http://en.wikipedia.org/wiki/Bill_Watterson paragraph labelled "College." Canadian Prime Minister Stephen Harper and German Chancellor Angela Merkel are set to meet together to discuss austerity, European debt, and stagnant economic growth in many countries of the world. Both Germany and Canada have weathered global economic downturns well and some look toward them both as models for other countries. Yet, both countries continue to struggle to post positive economic growth while residing close to other economies which have been severely affected by global events. Both Germany and Canada have relatively small populations but account for much global industry. This meeting will give two of the world's strongest economies a chance to consider the options regarding Europe's soaring debt and poor economic growth. It also gives me an opportunity to consider how fortunate I am to live in Canada. In the midst of a world struggling with austerity plans and huge debts (Ireland has a debt of approximately 20 million Euros per person) I am very thankful to be living in Canada. In fact, I want that to be my first response to the world economic crisis: thankfulness. Beyond thankfulness I pray that I can have an attitude of generosity. However other countries got into the situation in which they find themselves, I want to help them get out of it. Many times I am tempted to live a frugal life simply so that I can store up more for myself and my family. But what if I turned that attitude around and lived frugally and with austerity so that I might help someone else? We can consider how Canada and Germany might help others to find the way back to fiscal responsibility. We can model fiscal responsibility, generosity, and thankfulness. “Anyone who has two shirts should share with the one who has none, and anyone who has food should do the same.” Luke 3:11. "Do not work for food that spoils, but for food that endures to eternal life . . ." John 6:27. The Tin Man is a fictional character in the American fairy-tale, The Wizard of Oz. The Tin Man is convinced that he could be a much better person if he only had a heart. He wants others to believe in him but he is not confident in himself. After many adventures, along the Yellow Brick Road, which show that the Tin Man, and his companions, already possess the characteristics which they have been seeking, we realize that the Wizard of Oz does not need to, and indeed has no power to, give them anything. How many of us desire to be good, prayerful, holy, loving, generous, or valiant and treat it as a destination to which we one day may attain. Yet, by God's grace, we already possess the ability to achieve these qualities. They are evident only as we express them along the journey toward His Kingdom. 1 The Wizard of Oz. Directed by Victor Fleming. Performed by Jack Haley. 1939. In April of 2012 I received a Master of Christian Studies degree from Regent College. The final comprehensive paper for this degree was an assimilation of years of study in theology and genetics. The paper allowed me to ask many questions related to the current state of both of these disciplines and allowed me to begin the work of understanding the relationship between the two within God's sovereignty. The following is a short excerpt from the introduction to that paper which outlines some of the questions we must ask as we attempt to understand both the Bible and the universe created by God. Those who find this blog of interest may wish to read the entire paper. Contact me and I will send you a copy. Never before have humans had the capability to look with such detail at the genomes of humans, apes, and early hominins such as Neanderthals, and Denisovans. The Human Genome Project (completed in 20031) and great ape counterparts (e.g. Chimpanzee Genome Project2) have given us the complete genomic sequence of each of these species and have allowed scientists to compare the sequences to see similarities and differences. We now know from this information that the genomes of humans and chimpanzees differ by only 1%.3 In recent years, two other lines of information have created even more puzzling questions. First, population genomics studies have advanced significantly in the past few years. The math and details of such analysis are far beyond the scope of this paper4 but Dennis Venema has nicely summarised some of the pertinent information which creates a number of new questions. He points to recent papers detailing the use of SNPs (single nucleotide polymorphisms) which have now "estimated ancestral population dynamics for various human groups over time in more detail than is possible with mutation-based estimates. "5 He shows how these studies can create estimates of ancestral human population sizes at several time points in our evolutionary history. This approach consistently shows that "humans, as a species, are descended from an ancestral population of at least several thousand individuals. . . . [and] that our lineage has not experienced an extreme population bottleneck in the last nine million years or more. "6 Such conclusions have vast implications for the usual theological understanding that all humans are descendants of a single ancestral pair or that we are all descendants of Noah. Comparisons of the genomes of modern humans (Homo sapiens), Homo neanderthalensis, and Denisovans, something that has only been possible in recent months, leads to some remarkable discoveries. The discussion by Green and other scientists in Nature9 indicates that, based upon dentition and DNA, the Denisovan species appears to be a separate species from both Neanderthals and modern humans and that all three share a common ancestor. They also show that, although Homo neanderthalensis and the Denisovan species went on to become extinct, they did coexist with Homo sapiens and inter-bred with humans of a concurrent time. Green, et al., put forth a theory in which the Denisovan species diverged from the Neanderthal species which had previously diverged from the Homo sapien species. It has been previously widely accepted that Homo neanderthalensis interbred with Eurasian, but not African, Homo sapiens and contributed 1 to 4% of their genetic material to modern Eurasian people groups. Green and his collaborators further suggest that the Denisovan group interbred with the ancestors of contemporary Melanesians and contributed 4 to 6% of their genome to this population but did not contribute to other Eurasian or African populations. Appendix 1 shows this evolutionary divergence and intermingling in schematic form. This Nature paper presents ideas that, although they are preliminary, have the potential to create huge theological questions for those who take seriously both the Bible and God's book of revelation in nature. In what way can we speak of an historical Adam? Where would we place an historical Adam into the picture of this divergence of populations? Indeed, where might we place Adam in the schematic picture shown in Appendix 1? From a theological perspective, at what point in such a process would we suggest that God placed his image upon humans? Should we place this after the divergence from the Neanderthal and Denisovan populations? Should we place this before or after the admixture with the Neanderthal and Denisovan populations? If we place it before this admixture, what are the theological implications of the dilution of the image of God with beings who did not have the image of God? If we locate the imparting of the image of God at the level of the common ancestor of all of these peoples, how do we understand the three distinct people groups and the extinction of two of them? This interbreeding data raises other questions of timing with regard to the African line of humanity which does not show evidence of interbreeding with the non-human hominins. At what point would we place humanity's rebellion toward God as understood in the Fall? How do we understand our "inheritance" of original sin in such a complex pedigree? This paper will not answer all of these questions. They are raised to give the reader a sense of the complexity of questions related to comparative genomics and theology. This paper will look at one of the questions which arises out of such analysis. It is perhaps the biggest theological question from which many others will follow. In light of these recent scientific findings, how do we understand the historicity of Adam? Click on this thumbnail for a larger image. 4 One may wish to read Venema's paper for a non-specialists explanation of the techniques behind the research. In this paper he also refers the reader to a review by other authors for those that wish to go deeper. 6 (Venema 2010, 175) In the context of his paper, Venema's reference to an "extreme population bottleneck" refers to the kind of bottleneck that would be necessary to suggest descent from less than 10 individuals (Noah's family or Adam and Eve). Scientists can point to population bottlenecks of approximately 10,000 individuals. Green, Richard E., and David Reich. "Genetic history of an archaic hominin group from Denisova Cave in Siberia." Nature 468 (2010): 1053-1060. Venema, Dennis R. "Genesis and the Genome: Genomics Evidence for Human-Ape Common Ancestry and Ancestral Hominid Population Sizes." Perspectives on Science and Christian Faith 62, no. 3 (2010): 166-178.
dad who loves dancing with his little girls. oh and the relentless pursuit of athletic excellence. Even as Simon Whitfield crashed in the Olympic triathlon he had already shown himself to be a fitting representative of Canada. Long before he started the race he had spoken in ways that showed that he took it seriously that his wife and children sacrificed much to allow him to be an international triathlete. He spoke of his wife and himself being a team. Whitfield is a man who gives all he has got to run the race marked out for him but he also recognizes he does not do this without a Canadian team and a family that supports him. “It was hard to see my daughter [Pippa] upset and my wife. I was pretty upset. That’s life. That means it means something." He recognizes that his athleticism means something to him, to his wife, and to his children. He was upset for them because he knew that they had poured much into his success. I am proud that Simon Whitfield carried the flag for Canada in the parade of nations. He is an awesome Canadian role model. Therefore, since we are surrounded by such a great cloud of witnesses, let us throw off everything that hinders and the sin that so easily entangles. And let us run with perseverance the race marked out for us, fixing our eyes on Jesus, the pioneer and perfecter of faith. For the joy set before him he endured the cross, scorning its shame, and sat down at the right hand of the throne of God. Hebrews 12:1-2. "Dare mighty things" is a slogan used extensively by NASA in promotional videos for the Curiosity Rover landing on August 5, 2012. I tuned into NASA TV 1 last night to watch the entire sequence of events from the vehicle's approach to Mars, through entry into the atmosphere, parachute deployment, rocket pack maneuvers, sky crane operation, landing on the surface, and finally, first pictures back after Curiosity oriented herself on the surface of Mars. It was an extraordinary event and it was amazing to watch the optimism, tension, fear, elation, victory, celebration, and tears of the men and women in the Jet Propulsion Lab at the California Institute of Technology. This was the culmination of an eight year project to get this rover to Mars. Everything hinged on a complicated landing system that would safely deposit the rover on the Martian ground so that the real science of analyzing the surface of Mars could begin. There are plenty of take-away messages from ventures like this. Perhaps we could incorporate the "dare mighty things" into a lot more of our life. What could be accomplished by working together in teams? How can we use the mighty deeds accomplished by this team to inspire us in our work lives, our families, our churches, our communities, and our country? What indeed are we capable of accomplishing? What mighty things are sitting on the shelf in our own lives waiting for us to dare to accomplish them? Today, while there is still time, dare mighty things! detective fiction appeals to our deep yearning to discover patterns, to uncover secrets, and to impose order on what seem to some to be an unrelated series of events, yet to the initiated are the vital clues that lead to the solution of the mystery. . . . The question being asked, whether in science or religion or detective fiction, is this: What greater picture unifies our disparate observations? How can the threads of evidence and observation be woven into a tapestry of truth? . . . I like what McGrath is saying because this vision also captivates my mind. I find that I am still seeking knowledge that will help me piece together the universe in which I live and help me find meaning. I hope that all of my life I will continue to ask the big questions of life: How did this universe come to be? What does science tell us about our world? What are the best theories on the mechanics of how this universe came into being? What does the Bible and theology tell us about purpose and meaning? How do we make sense of God, the Bible, and science? McGrath quotes Michael Polanyi (1891-1976), the Hungarian chemist who also explored the philosophical implications of the scientific method as saying, “The pursuit of discovery, . . . is guided by sensing the presence of a hidden reality toward which our clues are pointing.” May we always search for truth and never fear it; for all truth is God's truth. May we never lose the wonder of searching for reality. May we always be guided by the clues to the great truths of the universe. McGrath, Alister E. "2009 Drawbridge Lecture." Shipoffools.com. November 12, 2009. http://shipoffools.com/features/2009/pdfs/ces_2009_drawbridge_lecture.pdf (accessed August 5, 2012). Many years ago I read a small book by Dr. Paul Yonggi Cho, pastor of the largest Christian Church in the world.1 Cho is a man who has devoted his life to prayer and has gone to great extremes to develop his prayer life. The book has had a large impact on me such that several years later I find I am still influenced by his prayer model. As a follow-up to yesterday's post, here is a more specific outline of his "incubation model" of prayer. Sometimes the scripture references are my adaptations of what I believe Cho was referencing even when he was not explicit. In some places the book only alludes to passages of the Bible flowing from the author's vast knowledge of memorized verses. 2. Have a burning desire: Proverbs 10:24 and Psalm 37:4. 3. Pray until you have peace and assurance. : Hebrews 6:11 and 11:1. 4. Speak the word and show evidence of your faith: 2 Corinthians 4:13. Take some time to consider whether this might be a helpful model for you in your prayer life. Then send me a comment to let me know if it helps. 1. Cho, Paul Yonggi. The Fourth Dimension. Plainsfield: Bridge Publishing, 1979, p. 9-35. On the one hand, it seems to make sense. On the other hand, it seems incomplete. Perhaps, as with many things in God's creation, we must hold two concepts in tension: "prayer changes me" and "prayer changes the world." My prayers are constantly influenced by all three of these spiritual guides. May we all pray and see more answers to prayer. 1. Jones, E. Stanley. Liberating Ministry From The Success Syndrome. Tyndale, 1988., p. 73. 2. Cho, Paul Yonggi. The Fourth Dimension. Plainsfield: Bridge Publishing, 1979, p. 9-35. 3. Phillips, Michael R., editor, and George MacDonald, author. The Highlander's Last Song. Minneapolis: Bethany House Publishers, 1986. p.35.